The plugin settings and what each one does. 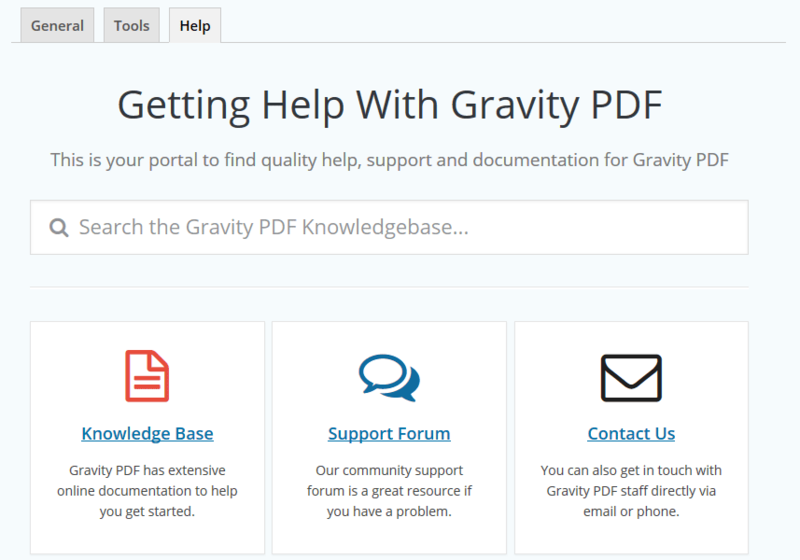 Gravity PDF is fully integrated into Gravity Forms. The PDF settings are located in a separate section in Gravity Forms own settings area. 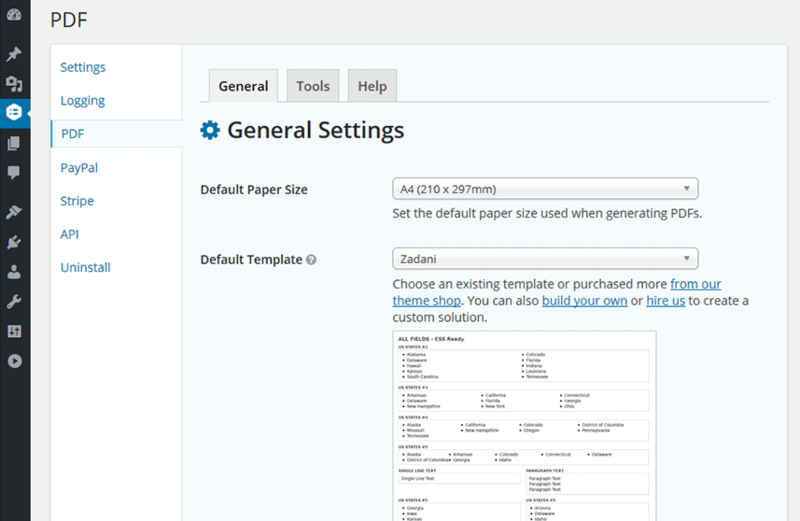 You can find it by navigating to Forms -> Settings -> PDF in your WordPress admin area. From here you’ll be able to control the PDF defaults like paper size, font and template. You also have advanced options giving you granular control over the security protocols. This tab is only available to users with the gravityforms_view_settings capability. By default this is administrators and network super admins (if running a multisite). Below is the list of settings available in the General tab, with a brief description about what each is for. Use this option to set the paper size for all individual PDFs. The default selection is A4 (210 x 297mm), but other common paper sizes such as US Letter and Legal are easily accessible. Also preloaded are the ISO-standard A, B and C paper sizes, as well as RA and SRA. If none of the preloaded options suit you can also select Custom Paper Size and control the width and height in millimetres or inches. This field is hidden until you select the Custom Template Option from the Default Paper Size field. It allows you to control the exact paper size of your document – in millimetres or inches. When displayed, this field is required and only positive numbers are permitted in the width and height inputs. Use this option to set the default template for all individual PDFs (templates control the PDF design and layout). Gravity PDF comes with four completely-free templates for you to choose from. Upon changing your selection (using the drop down) an image will load showing you what the chosen template looks like. The default template is Zadani – a minimalist business-style template that will generate a well-spaced document great for printing. Additional templates can be purchased from our template shop and installed through our PDF Template Manager. Developers with HTML, CSS and a little PHP knowledge can create their own designs and layouts. Alternatively, the Gravity PDF team offers design and integration services for those looking for a custom solution – we can even integrate existing PDF documents. Use this option to set the default font for all individual PDFs. Gravity PDF ships with fonts for the majority of languages worldwide and uses the unicode typeface DejaVu Sans Condensed by default. For languages that aren’t supported out of the box, you can use our Font Installer to upload TTF or OTF font files for use in PDFs. Use this option to set the default font size for all individual PDFs. The default is set to 10pt. Increase or decrease to suit your font type. Use this option to set the default font colour for all individual PDFs. The default is set to black (hex colour code #000000). Use this option to default the text direction for all individual PDFs. Many languages worldwide are written from right to left – Arabic and Hebrew script are examples of this. The default is set to No, with RTL support disabled. This option determines if the PDF on your admin entry list/detail pages will be shown in your browser or a download prompt should be shown. By default this option is set to View. When enabled, users with the gravityforms_view_entries capability (the Administrator Role by default) will be shown debug messages when the [gravitypdf] shortcode cannot be generated. When disabled and an error occurs processing the [gravitypdf] shortcode no content is shown. By default this option is set to Disable. The advanced options focuses on PDF security and can be shown by clicking the Show Advanced Options... link (just above the Save Changes button). The security settings are configured with sane defaults and in most cases you won’t need to modify this behaviour. Our security documentation page focuses or the finer points of the plugin’s security protocols and is worth a read before changing these options. 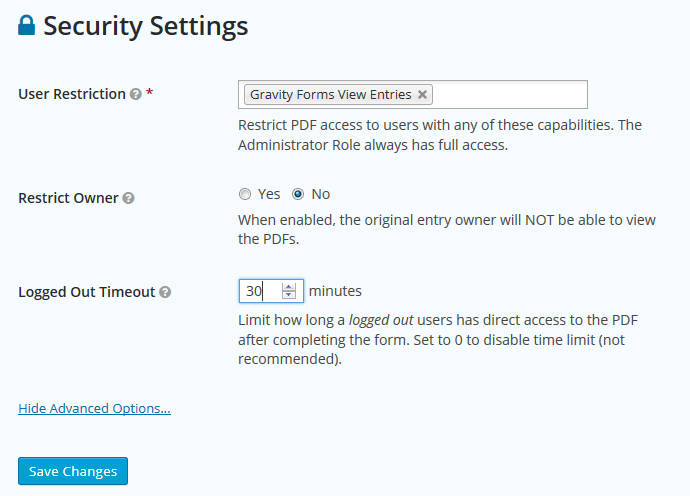 Logged in users who do not have the gravityforms_view_entries capability are prevented from accessing any PDF if they aren’t the original owner – the owner is who filled in the form entry originally. If you leave the setting untouched only site administrators and network super admins (if running a multisite) can view the generated PDFs. To change this behaviour you can assign capabilities that other roles have access to. For instance, if you wanted the Editor role to have access to PDFs you could add the edit_pages capability. Alternatively, instead of adding additional capabilities to this field you could use a role editing plugin like User Role Editor to give an existing role the gravity_forms_view_entries capability. Choose the best solution for your use-case. This option has no effect on PDFs sent as attachments in Gravity Form notifications but does effect the [gravitypdf] shortcode. More information about WordPress roles and capabilities can be found in the WordPress codex. This option allows you to prevent the form entry owner – the user who filled out the Gravity Form – from viewing the generated PDF. This included logged out and logged in users – with the exception of a logged in user who has any of the capabilities listed in the User Restriction field. The default option is No. When a logged out user attempts to view a PDF the plugin will try and match their current IP address against the one saved with the Gravity Forms entry. If they match they get access. However, this method isn’t a secure long-term option because IP addresses can change. To prevent unauthorised access we implemented a timeout feature. After X amount of time the user no longer has access to the generated PDF. By default this timeout is set to 20 minutes. While it is not recommended you can disable this feature by setting the timeout to zero (0). The tools tab contains useful functions for power users. You can install additional fonts for use in your PDF documents, prepare your system for custom PDF templates and uninstall the plugin. This tab is only available to users with the gravityforms_edit_settings capability. By default this is administrators and network super admins (if running a multisite). Below is the list of settings available in the Tools tab, with a brief description about what each is for. 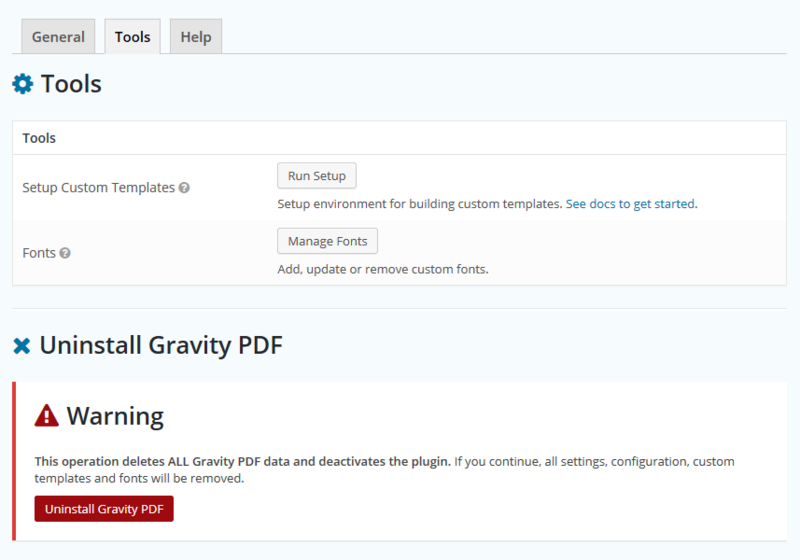 Gravity PDF uses a templating system similar to WordPress’ child themes. The core templates that ship with the plugin are located in the /src/templates/ directory (it acts like a parent theme), however you cannot modify these files without losing your changes when the plugin is updated. To circumvent this issue templates can be placed in the plugin’s working directory /wp-content/uploads/PDF_EXTENDED_TEMPLATES/ (the child theme in our analogy). From here you can edit the templates as you see fit and you won’t lose your modifications during updates. The Setup Custom Templates option copies all the core templates to the PDF_EXTENDED_TEMPLATES directory. If you have previously run this setup the core files in this directory will be overridden. Before running this function it’s recommended that you review our developer’s guide to templating. If the particular font provides different files for bold, italic and bold-italic typefaces you can optionally include them. A faux bold, italic or bold italic style will be rendered in the PDF if they are not set. Once a font is installed you can select it in the PDF settings. If creating a PDF template you also have the option to set the font family directly using CSS (a helpful snippet is provided). Review our Font Manager documentation for more in-depth details on managing PDF fonts. This option will completely remove the plugin from your website and clean up the database and file system – it will be as if the software was never installed. Any custom templates you have will also be deleted. During the uninstallation the plugin will automatically deactivate and redirect you to the plugins page. When the uninstall button is clicked a warning box will pop up asking you to confirm before continuing. A user must have the gravityforms_uninstall capability to complete this action. By default this is only site administrators. If running a multisite, only a network super admin can do the uninstallation.